A sparkling Sydney summer’s day is the perfect time to take your top off and get a little colour. 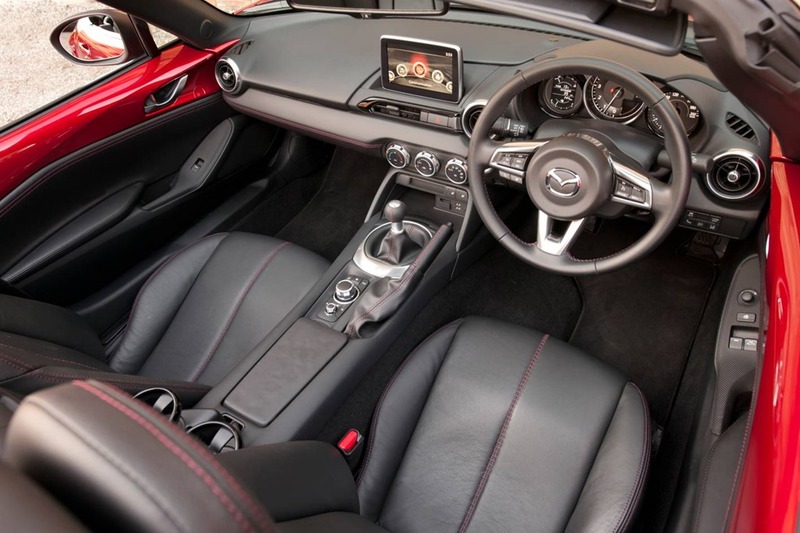 In the MX5 you don’t have to wait 30 seconds, or 15 seconds or even 5 seconds, just click and drop. In a few seconds you’re open to the sky. The original 1989 model didn’t have power steering, but that didn’t stop it from being fun. It was a minimalist reflection of the British droptops of the 60’s and drove like a roller-skate. When MX5 came out it had the market to itself with only Alfa Romeo for competition. It was soon joined by Ford’s ill-fated, unloved, under-powered, poorly made Capri. It was dreadful and died a natural death, and good riddance to it too. On the other hand, MX5 was an instant classic and spawned owners’ clubs worldwide. 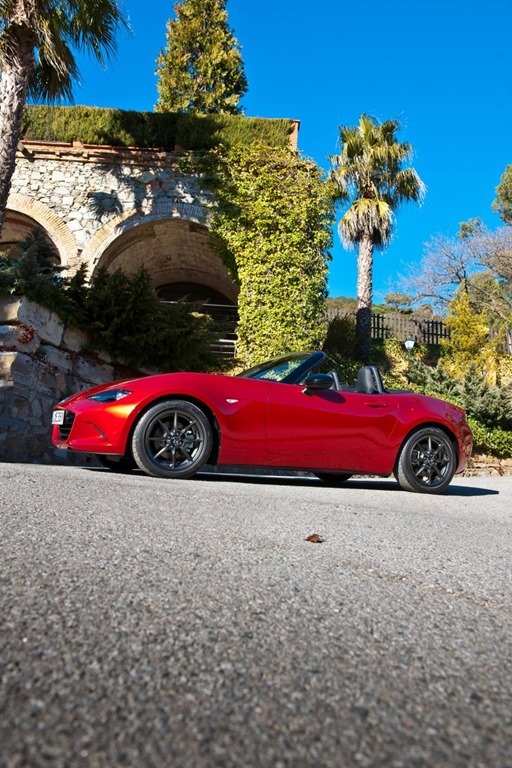 That first model is as good now as it was then, then came the 2016 MX5 and for me, it all changed. It is glorious. 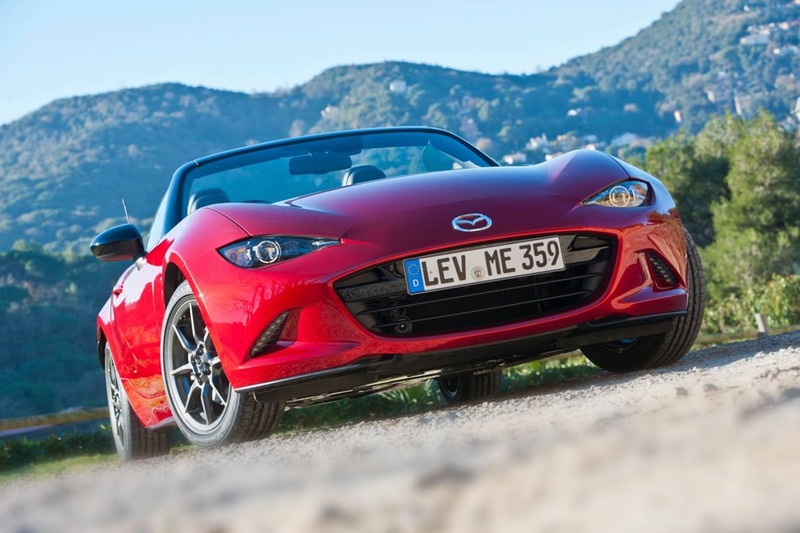 Over the decades MX5 got fat and expensive, and so was in danger of becoming irrelevant. Mazda said “Ah huh, we know where we went wrong”, and went back to the 1989 roots. It is pared back and low cost without being cheap and low-rent. 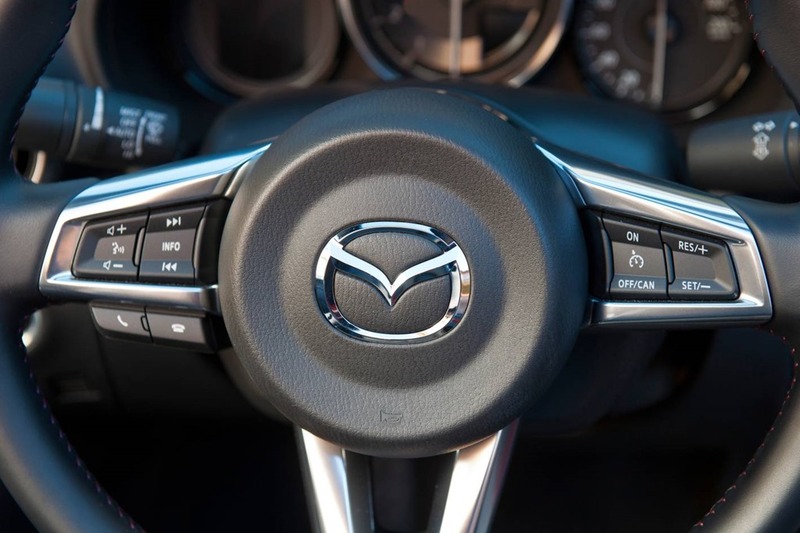 The base model1.5 manual has the standard Mazda interior complete with tablet-style LCD monitor with its centre console controller. Of course you have power windows and the usual safety accoutrements, but it’s the sense of the driver being in charge that is most rewarding. 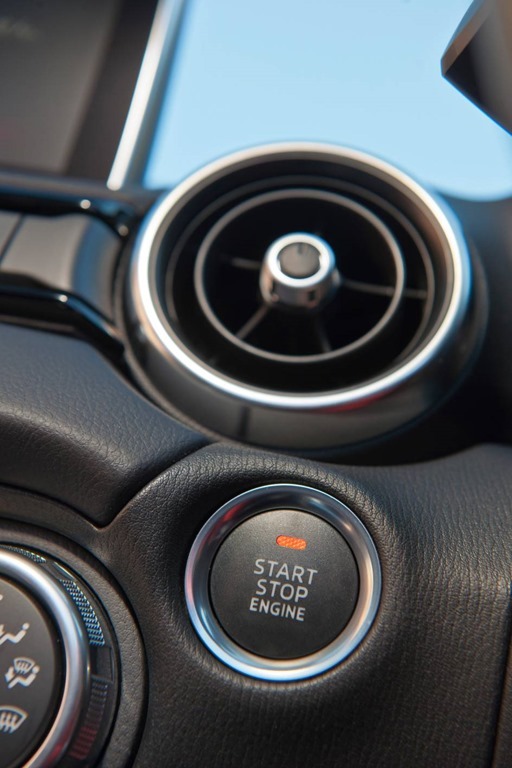 The pushbutton start brings the spritely 1.5 into life with a pleasing buzz to the exhaust note. From then on it is 100% fun. The roof comes down in 2 easy steps: 1-unlcip the roof lock, 2-swing the roof back over your head and neatly into the enclosure behind the seats. It takes a mere few seconds. To raise the roof, you simply pull the lever between the seats at shoulder height. The front section pops up about 20cms so you can quickly grab it and swing your arm back over your head. Once you press the clip shut, the roof is locked and you good to go in less time than it takes the self-obsessed to tweet a selfie. The 130L boot is a decent size for a very small 2 seater sports car. There is certainly plenty of room for a couple of overnight bags, a scarf, and a blanket, or one hundred and thirty litre-bottles of Johnny Walker. Think about it, a couple of bags, or enough booze for nearly a week? It is not a grand tourer nor is it a muscle car. What it is, is a spirited rear-wheel-drive 2 seater with the engine at the front and a boot at the back. It fits like a sports shoe and is every bit at home on the run to work as it is on the weekend picnic. I can picture it now: weekends, happy couples, sharp hair styles firmly held under caps, t-shirts and jeans, bottles of filtered water, beach towels in the boot. In short, a lifestyle. Car makers know this, that’s why they aim their products firmly at your hearts, not your brains. They sell you the car that goes with the lifestyle you want and if it happens to go with the lifestyle you have, then so much the better. The steering and brakes feel direct and sharp with a distinct “go-cart” quality to them. This is something all car makers strive for, but few achieve. The ride is on the soft side of firm especially for a sports car. It corners with a little body roll but nothing too alarming. The manual is as sweet as a nut and the flexible 1.5 is silky and free-spinning. The 96kw 4 cylinder is shared with the Mazda 2 and has the eagerness of a bouncy new puppy. It’s joy from start to finish and you find yourself inventing reasons to take the car out for a spin. Because the roof is so easy to use you’ll probably want to keep it down unless it’s raining. There is a little wind noise with the roof and windows down but that’s all part of the experience. In fact, it adds a certain verisimilitude making the driver feel like part of the world instead of being cut off from it in and air conditioned bubble. I’m a huge convertible fan and always have been. 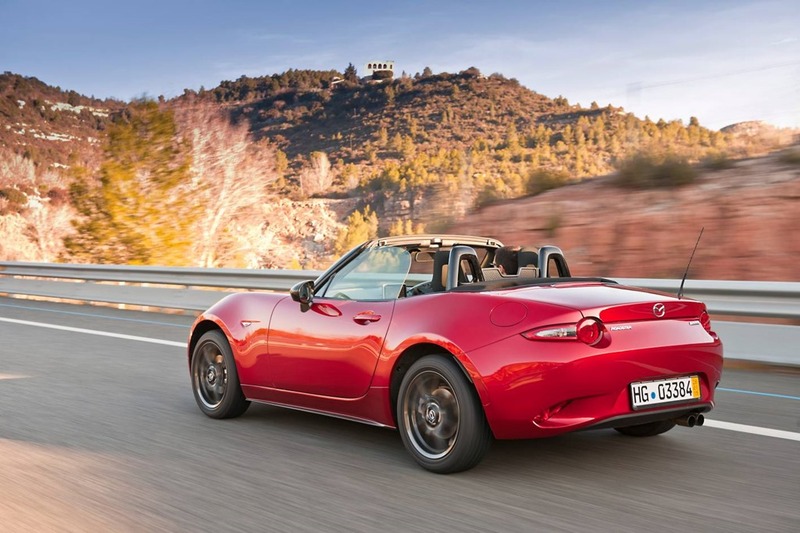 I don’t think I’m telling tales out of school by saying the MX5 has a twin sister, the Fiat 1.4turbo 124 Spider which should be here in a year or so. I think the Mazda is better looking but perhaps I’m biased. I’ve always hankered a secret yearning for an MX5. They are better value now than ever and have an unlimited 3-year warranty plus bullet-proof Japanese reliability. The upper model gets extra stuff, but do you really need it? It’s arguably Japan’s best looking car just now, but again, I’m a fan. Our drive was all too brief but ever so rewarding. MX5 is about lifestyle and if that is what Mazda wanted, they should be pleased. MX5 isn’t perfect but it is as near as makes no difference. We hope to bring you a longer test soon.